It has come to our attention that particular Beko, Leisure and Flavel cookers with a separate oven and grill can, if they are not operated in accordance with the user instructions, pose a serious risk to your health. Models affected are from the years 2003 to 2008 with serial numbers starting 03 to 08. Our customer care centre is open from 8am to 8pm, Monday to Friday, and 10am to 4pm Saturday and Sunday. 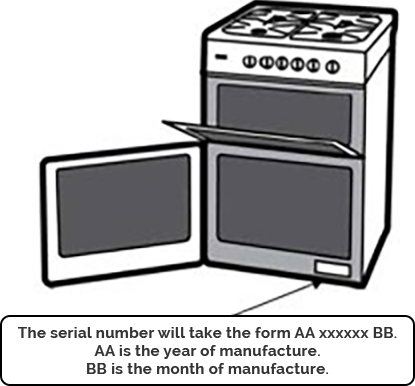 When calling please have your full model number and serial number to hand - these can be found on the rating plate at the bottom front edge of the appliance (see details right). Register your Leisure appliance now to receive notifications about future product updates or service repairs.